When you place a loved one in a nursing home, it is because you expect that their daily needs will be met. You expect that qualified staff members will assist your loved one in the process of eating, changing clothing, personal grooming and being transferred from a medical bed. You want to know that your loved one is receiving protection in a nursing home facility. Unfortunately, nursing home abuse has become such a serious problem in facilities throughout the United States that it is no longer possible to simply assume a loved one is safe or protected in a nursing home. Family members must closely watch the practices of nursing homes to make sure that staff members are treating loved ones in the appropriate manner. This means that loved ones are receiving the medications they need, proper nutrition, physical therapy services and are also being treated with dignity and respect. 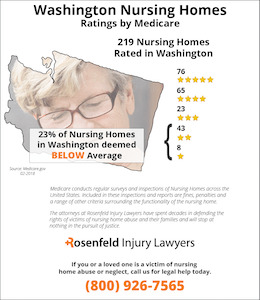 According to information gathered by Medicare, there are 219 nursing homes rated in Washington. The federal agency found that fifty-one (23%) of these Washington State nursing facilities were identified with severe deficiencies and violations that led to substandard care of their residents. Was your loved one abused, mistreated, injured or did they die unexpectedly from neglect while residing at a Washington nursing home? If so, we encourage you to contact the Washington nursing home abuse & neglect lawyers at Nursing Home Law Center today. Let us begin the process your claim for compensation during an initial free case review. 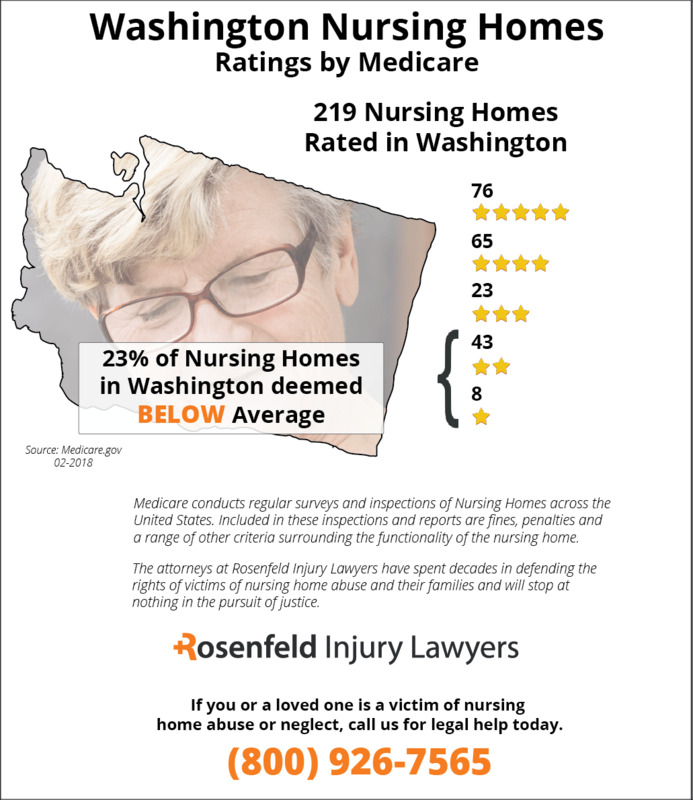 In Washington, the statistics show that nursing home abuse and neglect are problems that impact numerous facilities in the state. A University of California-San Francisco research study found that over 40 percent of nursing home facilities have serious issues in regards to quality of care and maintaining professional standards. In 2008, there were also issues in regards to the fact that over 62 percent of facilities had an accident-prone environment. Nursing home abuse has become commonplace, and it is vital that you act to protect your loved one when necessary. Under the federal law, the Nursing Home Reform Act of 1987 is the major source of legal authority for upholding the rights of residents. There are numerous rights outlined in this federal statute, and there are also sanctions for nursing homes that fail to uphold these rights. 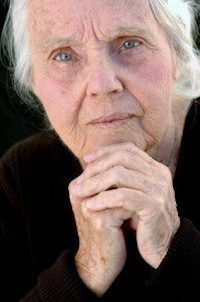 When a nursing home engages in prohibited behavior, such as the use of physical or chemical restraints, they may be subject to sanctions that include prohibition from Medicare or Medicaid funding programs. Other sanctions that may impact Washington nursing homes include a directed training program for staff members, directed plan of correction, payment of civil penalty fees, new management services and termination of the provider agreement. The state legislative authority in place to oversee the treatment of residents at nursing homes is the Abuse of Vulnerable Adults Act. The Abuse of Vulnerable Adults Act sets forth the processes for reporting abuse, department investigation of abuse and ultimate protection services that are available for adults who have been abused. The statute also creates a cause of action for damages in regards to those who have been victims of abuse. The statute encourages a negotiation process with the health care provider, so family members should get in touch with a nursing home lawyer to assist in this resolution process. If the dispute is not resolved in the least formal setting possible, then it is possible for the parties to pursue a claim in court. There are several departments for which family members may report nursing home neglect in Washington. These departments include the Washington State Department of Health, Adult Abuse Prevention Act, Aging & Disability Services Administration and the Long-Term Care Ombudsman. At the Long-Term Care Ombudsman Program, family members can receive information about nursing home neglect in Washington. They may wish to further understand what constitutes neglect or abuse in Washington, and the ombudsman program can help. In addition, family members can obtain information about the past incidents of abuse or neglect at nursing homes. There may have been a pattern of neglect at one’s nursing home facility that family members were not aware existed at the time of enrollment. Nursing home lawyers are also available to help you get information from this critical office in Washington. Talk to our lawyers today so that you can learn more about how we can help your case. More individuals than ever before are enjoying their retirement years. 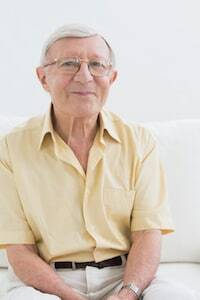 However, because the average population is growing older, many of the elderly are no longer able to take care of themselves without some type of assistance. As a result, there has been a substantial increase in the need for Washington State nursing facility beds. Many nursing homes across the state of Washington are urgently looking for quality caregivers. The increase in health care needs of the elderly has placed a significant demand on the number of nurses and nursing aides highly trained in taking care of seniors. In many cases, adult children separated from their aging grandparents and parents have no other alternative but to place them in a nursing facility. It is their expectation that the needs for their daily activities and healthcare maintenance will be provided by trained staff at the nursing home. Sadly, many nursing facilities lack proper staffing or provide caregivers with inadequate training. Because of that, many patients are victimized by the inattentiveness, neglect and abuse of their caregivers who are unwilling or unable to provide adequate care. Without proper patient monitoring it is very easy for a resident in a nursing facility to develop a skin wound. Bedsores (pressure sores; decubitus ulcers; pressure ulcers) are injuries to the skin and underlying tissue. These wounds typically start developing when body pressure continuously touches a chair, padding, mattress, bedding material or other body part for hours at a time. The applied pressure usually stops blood flow circulation to a specific area on the body. The restricted blood flow stops oxygen from reaching the skin, causing it permanent damage or death after just a few hours. Some areas are more susceptible to developing a sore than others. These areas include the ankle, heels, toes, buttocks, spine, sacrum, hipbones, shoulder, shoulder blades, neck and the back of the head. In its early stage, a bedsore can appear as nothing more than a reddened area on the body, or display red dots or blisters. Without immediate attention, the condition can worsen to an advanced stage where a small crater is formed at the affected site. Within days, the shallow crater can deepen significantly exposing bones, muscles and tendons deep into the wound. It is usually at this stage where infection can take hold, compromising the health of the patient. Antibiotics are usually needed to combat sepsis (blood infection) and/or osteomyelitis (bone infection). Many nursing facilities do not create or implement effective monitoring protocols designed to ensure that the healthcare of every patient is optimized. Without monitoring protocols necessary to assess and evaluate the skin of the patient once or twice every day, the patient’s health is often at risk. Strictly enforcing these protocols is crucial to ensure that the medical team follows scheduled “turnings” or readjustments of the patient’s body to alleviate pressure. This is especially important for any patient who suffers mobility challenges and lacks the ability to move, readjust or turn their body on their own without help. For many families, the loved one in a nursing home is too many miles away to visit on a routine basis. Because of that, they are often shocked to hear that their loved one is suffering from a facility-acquired bedsore. Typically, the only way to take control of the situation is to hire a Washington decubitus ulcer attorney who specializes in medical malpractice claims. Fill in the form here to contact a reputable Washington decubitus ulcer attorney. Your lawyer can accept your case on contingency to help you seek the financial compensation your family deserves.